The lender has the security of the personal guarantee of one or more directors and/or their spouses and/or some other third party. The guarantee is worded to cover every obligation of the borrower. 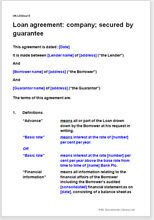 In many cases, a guarantor is much more effective than other types of security (like houses, shares or jewellery) because non-repayment risks a relationship and the reputation of the guarantor as well as of the borrower. Another advantage is that, in most situations, the lender only needs to satisfy himself that the guarantor has sufficient assets overall, and therefore doesn’t have to perform detailed valuations of individual items.